This is my favorite simple chicken salad recipe. You can change it around by taking out celery, almonds or pickles, if your family prefers. This is how to make chicken salad. 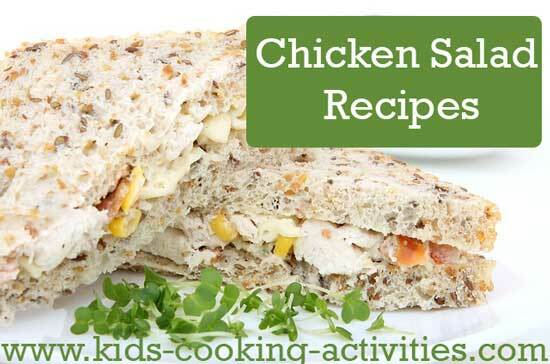 In mixing bowl, add cooked chicken, celery, cheese, almonds, chopped eggs, and pickles. Stir ingredients together. In separate bowl, add mayonnaise, salt, and lemon juice together. Mix into chicken mixture. Spread on croissant, hard roll or pita bread. This recipe can be made ahead of time. It can also be served warmed up in the oven. Kids can help by adding ingredients and chopping hard boiled eggs with a table knife. Mix together seasoning, lime zest, lime juice and honey. Pour into sealable ziploc bag or container and marinate chicken several hours. Cook chicken and pour off excess marinade. In a serving bowl, mix chicken, pineapple, salad and cantaloupe. I love this salad because it has all the ingredients I like and its easy. 2 cooked chicken breasts skinned and cut into thin strips. 1 bunch of baby spinach leaves torn into pieces. 225g (or just 2 potatoes per person) small potatoes cooked. Mix the chicken with the potatoes,spinach leaves,and cashew nuts. Blend the sour cream with mayonnaise, salt, and pepper. Mix the sauce in with the chicken mixture. 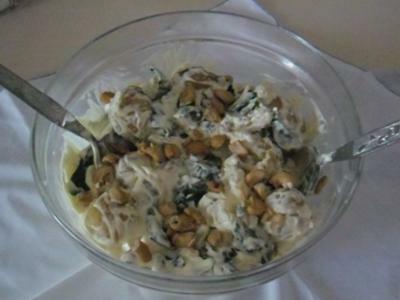 Sprinkle a little bit of cashew nuts on top to decorate.Spoon into a salad bowl and pop into fridge to chill. Well, I had family coming over and I needed to get some Hors doeuvres for them. 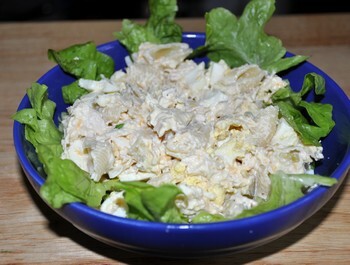 So I quickly whipped up a simple chicken salad recipe with a twist! 1. Sear Chicken on both sides in a skillet until fully cooked. Then lay aside. 2. Cut Tops off of Bell Peppers. Take seeds out and place on lightly greased baking sheet and roast for approximately 5 minutes. 3. Cube up chicken and take peppers out of the oven. 4. Combine jalapenos, chicken, lettuce, ranch dressing, mayo, parsley, salt 'n' pepper in a bowl until completely blended. 5. 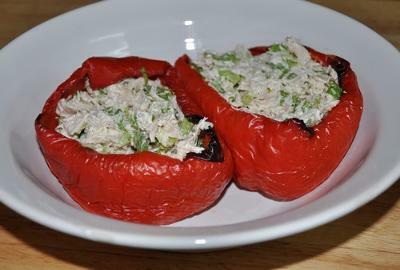 Stuff peppers with chicken salad and well, ENJOY!!!!!!!!!!!! 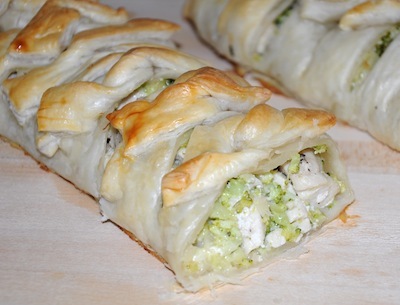 Try a chicken salad twist. Its easy and delicious! Share your easy and simple chicken salad recipe?